PlayerUnknown’s Battlegrounds is the hot new video game taking the world by storm, with 8 million copies sold and 700K concurrent users across Steam since its debut as an Early Access Microsoft Windows/PC title in March 2017. Despite its crazy numbers and fanfare, you would be forgiven if you didn’t realise its first ever esports tournaments were being held just months after its debut as an Early Access PC title. This is perhaps the fastest amount of time an unfinished game has climbed the ranks to become a serious esports contender due to its unique position as the poster child of the emerging ‘Battle Royale’ genre, and we’re excited to see if it can grow big in 2018 and beyond. PlayerUnknown’s Battlegrounds (PUBG) is best described as a multiplayer online ‘battle royale’ or ‘last man standing’ competitive video game, where up to one hundred players fight for survival on an isolated island approximately 8 by 8 kilometres (5.0 mi × 5.0 mi) in size using whatever they can find. Players parachute onto the island at the beginning of the match and must scramble to scavenge equipment, weapons and shelter to kill and outlast their opponents; whoever is the last player or team left alive wins the round. Considering the popularity of such survival films as Battle Royale and The Running Man which were clear targets of inspiration, it’s no wonder PUBG has exploded in popularity since its release. Solo FPP (first-person perspective): Same as solo, but you must play in forced FPS. Duo FPP (first-person perspective): Same as duo, but you must play in forced FPS. With procedurally generated items, weapons and events, the average match of PUGB is often unpredictable, which is exactly why many are excited to see the game get a serious chance at becoming a worldwide esport once the game achieves final release. PlayerUnknown’s Battlegrounds had its first major esports event in May 2017, when Bluehole Interactive hosted the 2017 Charity Invitational to raise money for the Gamers Outreach Foundation, eventually generating US$120,000 in donations and US$100,000 when Bluehole matched its fans. The early competition effectively acted as a precursor or prototype to how future officially-organised PUBG esports matches would be structured. The Gamescom PUBG Invitational LAN Tournament came next and ran from August 23 until August 26 at the annual Gamescom event held in Cologne, Germany. Hosted by the Electronic Sports League in collaboration with Bluehole, 80 of the most popular PUBG pro players and live-streamers competed for a share of US$350,000 in total prize money. The Gamescom PUBG Invitational hosted matches across several game modes, including Solo, Duo, Duo FPP (first-person perspective) and Squad. Whichever team or individual players had the best score in 3 games would take the title of champion and the lion’s share of the prize-money fronted. An open qualifier team known as “Suisse My Baguette” won the duo tournament and took home a $30,000 grand prize, though much of the action and the hype was tempered by lousy camerawork. The Intel Extreme Masters Oakland – PUBG Invitational 2017 was held in November and featured a 20-team, 80-player tournament organised by Intel and ESL and took place in Oakland, United States, boasting a prize pool of US$200,000. Team AAA Gaming took home the grand prize. You can watch live streams for free of every PUBG esports match on your computer, smartphone or tablet – find out where to watch PUBG esports via live streaming. Will PlayerUnknown’s Battlegrounds become an esport I can bet on? 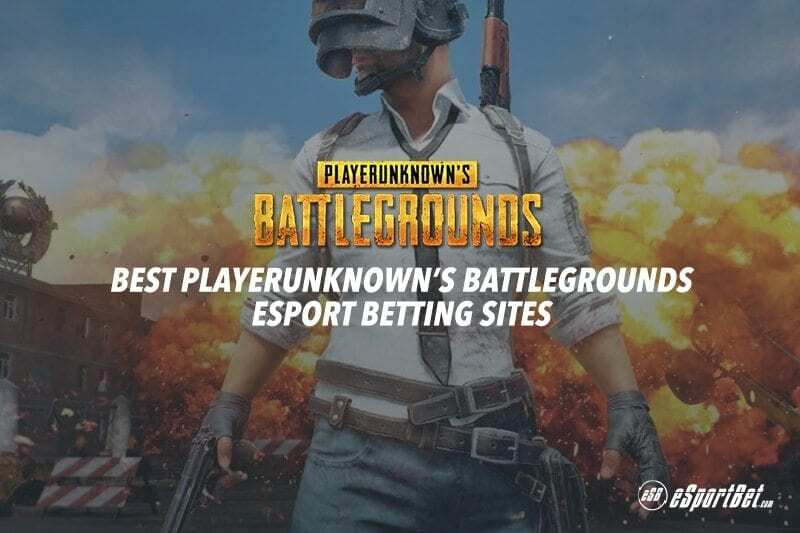 While it’s still too early to definitively state whether PlayerUnknown’s Battlegrounds will become a serious competitive esport that will match the likes of Dota 2 or League of Legends in raw numbers and prize pools, the fact remains it has well and truly entered the mainstream our favourite esports betting sites have already begun to offer betting options on the few upcoming esports tournaments scheduled for the game. It’s safe to say with its dedicated viewership and active playerbase, it has a serious shot of joining the ranks of other rising stars scheduled for greatness in 2018 like Overwatch and Rocket League. The editorial team here at eSportBet.com are fairly confident PUBG will be the next break-out competitive hit for the following reasons. Unprecedented player base and viewership The growth of PlayerUnknown’s Battlegrounds is hard to ignore, given it is the #2 most streamed game on Twitch, only lagging behind League of Legends in unique numbers. According to SuperData, PUBG has surpassed 200 million unique viewers, just shy of League of Legends’ 286M unique viewers recorded in October 2017 — the largest audience for a single esports game. PUBG’s viewership is curiously 20 times bigger than its actual player-base, which is a clear sign, if not already apparent, that the mainstream appeal is there. Sales and playerbase: PUBG has sold over 8 million copies and has surpassed the 700,000 peak concurrent users mark, which is more than some current esports games at the moment. Official recognition and participation from famous esports teams and franchises like Cloud9 Gaming, Luminosity Gaming and Team Liquid point to serious considerations and preparations for its full-scale launch into the esports scene in 2018. Widespread appeal: Multiplayer shooters are undeniably the most popular type of competitive video game on the market, and we don’t have to tell people how popular Counter-Strike: Global Offensive esports is around the world. PUBG has got all the hallmarks of the most popular games of the last decade – survival elements, loot boxes (pioneer crate), FPS and TPS gameplay, and very simple and straightforward death match premise most modern gamers can jump into fairly quickly.